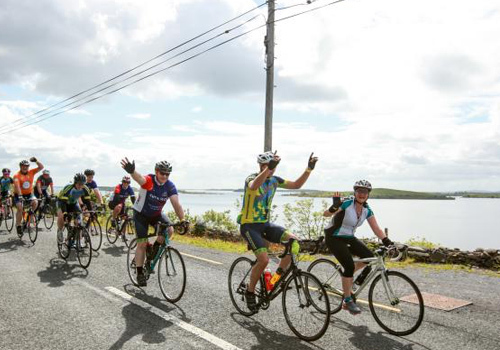 We’re on the countdown to the 22nd annual Tour de Lough Corrib on Sunday 4th June with only one week to go! In this week’s Cycling Tips for The Weekend we’re giving you our Top 3 Cycling Tips to ensure you’re all set up for next weekend’s cycle! Your safety is the most important thing when you’re on a bike. Cycling on roads can be dangerous so it’s imperative that you practice safety and obey the rules of the road at all times. Never ever cycle a bike without a helmet. The wearing of cycle helmets is compulsory during this event. If you do not have a helmet you are NOT permitted to take part in the Tour de Lough Corrib cycling event. Be aware of your surroundings and cars approaching – Avoid the use of headphones and earphone so that you can hear cars approaching from the rear. Before setting out on a long cycle it’s important you have your bike serviced to ensure your bike is mechanically sound and road worthy. We all know the importance of hydration – especially when exercising. Before setting out on a cycle, be sure you have a bottle of water with you and you keep well hydrated. Sufficient fluid intake is essential for exercise and optimum recovery. Exercising causes the body to get warmer, so the body tries to cool down by sweating. This causes the loss of water and salts through the skin. Generally, the more a person sweats, the more they will need to drink. If the weather is hot please be prepared. You will sweat more therefore you will require more hydration. Bring a bottle of water with you when setting out on the cycle. There will be stops along the Tour de Lough Corrib route, so you will have an opportunity to refill your bottle at these stops. Fuelling your body with the correct nutrition is important. A healthy diet for sport and exercise should contain plenty of starchy foods, plenty of fruit and vegetables, some protein foods and some dairy foods. Starchy foods are an important source of carbohydrates in our diet. Wholegrain varieties also provide fibre, which is important for digestive health, and a range of vitamins and minerals including B vitamins, iron, calcium and folate. Good sources of carbohydrates in the diet include; Bread, oats, wholegrain pasta, brown rice, potatoes (with skins) and other starchy vegetables (e.g. sweetcorn). Protein is also important for health and physical activity. The main role of protein in the body is for growth, repair and maintenance of body cells and tissues, such as muscle. Good sources of protein include fish, chicken, lean meats, eggs and dairy. Fat is an essential nutrient for the body, but it is also a rich source of energy. Consuming too much fat can lead to excess energy intake which can lead to weight gain over time. It is important to follow current healthy eating guidelines, ensuring fat intakes are no more than 35% of total energy intake from food, with saturated fat intakes not exceeding 11% of total energy intake from food. Good sources of fats include vegetable oils such as olive, rapeseed and sunflower oils, avocados, nuts and seeds. For the full guidelines on nutrition for sports and exercise please read full article here. How does hot weather affect my heart? When the weather is hot you sweat to cool down, but this means that you lose more fluid than usual from your body. This can drop your blood pressure and make your heart beat faster. This is not a problem for most people as long as they drink plenty of fluids, like water or other sugar-free drinks to keep from getting dehydrated. However, if you have a heart problem, extreme heat may place an extra burden on your heart and circulation, so it’s particularly important to stay cool and look after yourself. What can I do to keep cool? Avoid drinking too many alcoholic or caffeinated drinks. Caffeine-based drinks can cause you to lose more fluid from your body. 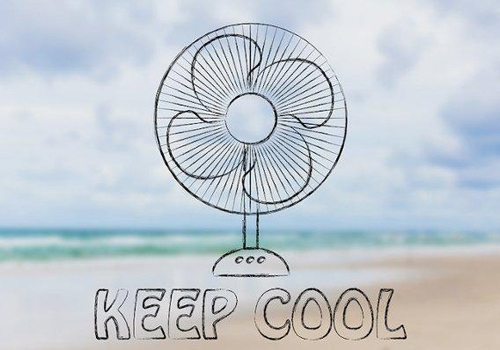 Make sure your home is cool when you're staying indoors. Stay out of the heat in the hottest part of the day between 11am and 3pm. If you have coronary heart disease, you may find you start to experience angina or your angina worsens during hot weather, because hot weather increases the workload on your heart and the demand for oxygen, especially when you are more active. It’s particularly important to stay cool if you have heart failure – where your heart doesn't pump as well as it should. If you’ve been told to restrict your fluid intake, speak to your GP about other ways to keep cool during summer. If you take water tablets and start to feel dizzy or light headed let your doctor know. Your dose can then be reduced or stopped for a little while, if needed, until you feel better. Losing too much body fluid can increase your internal body temperature, which could be life-threatening if left untreated. Symptoms of heat stroke include sweating, cold clammy skin, dizziness, fainting, muscle cramps, heat rash, oedema (swelling) in the ankles, shallow or fast breathing, nausea and vomiting. If you suspect that you or someone else has heat stroke, get medical attention immediately. Elderly people and very young children have more difficulty in regulating their temperature and so can be more at risk from extreme temperatures. In hot weather, check on your friends and relatives regularly to make sure they are cool and comfortable. 1. There are immediate and long-term health benefits of quitting for all smokers. Within 20 minutes, your heart rate and blood pressure drop. 12 hours, the carbon monoxide level in your blood drops to normal. 2-12 weeks, your circulation improves and your lung function increases. 1-9 months, coughing and shortness of breath decrease. 1 year, your risk of coronary heart disease is about half that of a smoker's. 5 years, your stroke risk is reduced to that of a nonsmoker 5 to 15 years after quitting. 10 years, your risk of lung cancer falls to about half that of a smoker and your risk of cancer of the mouth, throat, esophagus, bladder, cervix, and pancreas decreases. 15 years, the risk of coronary heart disease is that of a nonsmoker's. 2. People of all ages who have already developed smoking-related health problems can still benefit from quitting. At about 30: gain almost 10 years of life expectancy. At about 40: gain 9 years of life expectancy. At about 50: gain 6 years of life expectancy. At about 60: gain 3 years of life expectancy. After the onset of life-threatening disease: rapid benefit, people who quit smoking after having a heart attack reduce their chances of having another heart attack by 50%. 3. 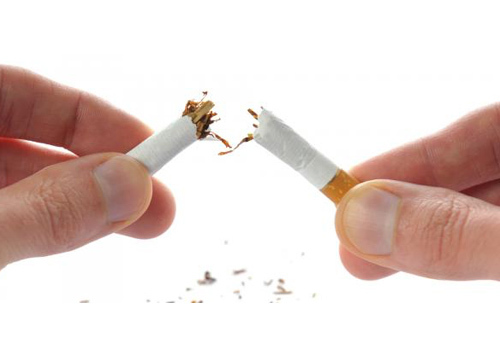 Quitting smoking decreases the excess risk of many diseases related to second-hand smoke in children. Quitting smoking decreases the excess risk of many diseases related to second-hand smoke in children, such as respiratory diseases (e.g., asthma) and ear infections. Quitting smoking reduces the chances of impotence, having difficulty getting pregnant, having premature births, babies with low birth weights and miscarriage. Quitting smoking is the single best thing you could do for your health. Here is some helpful information and tips to help you deal with the withdrawal symptoms and hopefully help you quit for life! ♥ Within 20 minutes your blood circulation will improve, your heart rate and blood pressure will lower – immediately reducing your risk of heart attack. ♥ Within 24-48 hours all the carbon monoxide will have left your body. ♥ Within a few days your sense of smell and taste will start to improve. ♥ Within 1 year your chance of a heart attack drops by half and within 10 years the risk drops to almost the same as a non-smoker. Difficult as they may be, nicotine cravings only last 3- 5 minutes. The key is to try distracting yourself for a few minutes, like drinking a glass of water, going for a 5 minute walk or calling a friend. The craving will lose its power and be gone before you know it. 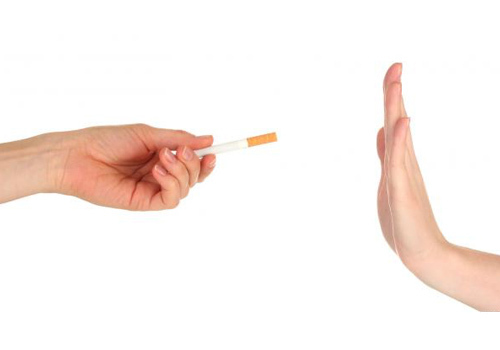 Recent research shows that by using Nicotine Replacement Therapy (NRT) or certain other drug treatments you can increase your chances of successfully quitting by as much as 50%. There is a lack of sufficient evidence on the effectiveness of e-cigarettes in helping people quit smoking. Over the period of a year, a 20 a day smoker accumulates the equivalent of a mug-full of tar in their lungs! Developing a chesty cough or sore throat soon after quitting is often just your body’s way of cleaning your respiratory tract. Increased anxiety, low mood, or irritability is common when you first give up smoking. These are temporary feelings and will ease after the first four weeks. Be aware that it’s easy to replace the craving for a cigarette with food, so your goal should be to try and avoid weight gain by only snacking on healthy options. Your sleep pattern may also become disturbed and it can take 2-3 weeks to settle. Try to relax and unwind before bedtime by reading a book or having a soak in the bath. Reduce your caffeine intake and try to increase your physical activity levels. So, just to re–emphasis, withdrawal symptoms only last for 4-6 weeks, so try to stick to your quit plan, be patient, believe in yourself and you will win the battle over cravings. More information and support to help you quit is available from the HSE QUITline on 1800 201 203, or from your GP, Pharmacist or Croí on 091 544310. In 2015, musician and accordionist Gerry King, passed away suddenly of a cardiac event. Prior to his passing Gerry’s sister Caitriona has tried to persuade Gerry to make a CD of his music. The CD did not emerge in his lifetime but thanks to the determination of his family and friends it has now been produced in testimony to his talent as an accordion player and to document his contributions to the traditional music legacy of Inishbofin, Co. Galway. On Friday 12th May 2017, Gerry’s family and friends came together at The Connacht Hotel, Galway and officially launched ‘The Ard Rí – The Music of Gerry King’. The King family chose Croí Heart and Stroke as the beneficiary of the proceeds received for the event. 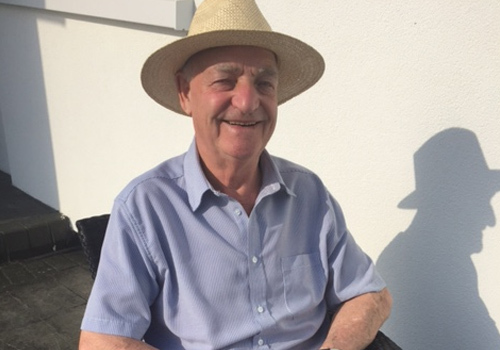 When Gerry joined the army in 1969, he was the only person in Dun Uí Mhaolíosa by that name. However, in 1975, a new recruit entered the barracks by the name of Gerry King also. As time went on, and one might be looking for Gerry, one would always get the reply: “Which Gerry King?” So one day, when I got this reply, I answered that I was looking for the older King or the High King. A Connemara lad replied “Ni fhaca mé an Ard Rí”! From here on in, Gerry would be known as ‘The Ard Rí’, a title of which he was very proud. Addendum: This nickname spread to the trad circuit in Galway and when trying to persuade Gerry to make a CD, his sister Caitriona, suggested he called it ‘The Ard Rí’, Gerry smiled and agreed it was a good name. 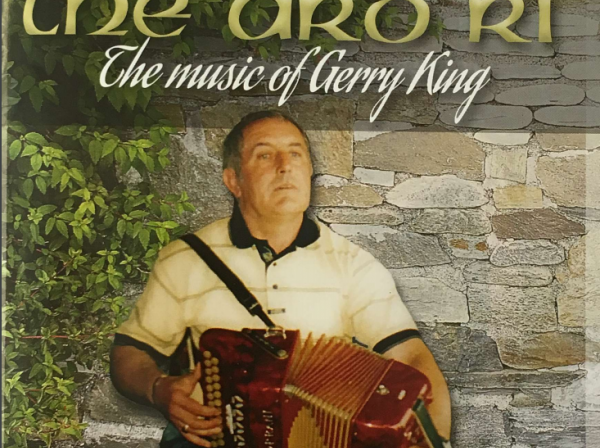 The Ard Rí – The Music of Gerry King is currently on sale now from Community Development Office, Inishbofin Community Centre and will be on sale at Croi Heart & Stroke Charity, Croí House, Newcastle, Galway from May 25th. More outlets to be announced follow The Ard Ri Facebook page for more updates. Dressing in appropriate cycling gear will make long distance cycling more comfortable. Consider getting yourself a good pair of cycling shorts – tight material is best, as loose shorts may cause chafing and skin irritation. For a the longer distance, such as the Tour de Lough Corrib 120km, invest in pair of padded shorts, these will make a difference to your saddle. If you use pedals with no clips, you'll need to wear special cycling shoes with a cleat fitted to the sole; they lock into a mechanism in the pedals, holding the shoes in place. They can take a while to get used to, but will create a more powerful and efficient cycling experience. When you get to the top of a long uphill, try not to coast downhill without pedalling. As you climb up the hill, lactic acid builds up in your muscles and can contribute to muscle soreness. By pedalling lightly but constantly while you are coasting downhill—even if there’s little resistance—you can help remove the lactic acid. When you’re cycling for a long distance it’s important to vary your hand and body position frequently. That changes the angle of your back, neck and arms, so that different muscles are stressed and pressure is put on different nerves. Avoid riding with your hands on the curved part of the handlebars for a long time. This may cramp your hands, shoulders and neck. Keep your arms relaxed and don’t lock your elbows. This will help you absorb bumps better. If you are relatively new to cycling or just back after a long break be sure to start back slowly. Don’t push yourself too hard, too soon. Take 30 minutes a day and cycling on flat terrain for three to four weeks. You can build your intensity and the type of terrain over time and gradually. Adding in hills will help build your fitness. The most important thing is to take it at your own pace and find your comfort zone. I am writing to you in response to your request to speak about my experience at GUH recently. My name is Denis Ryan. I am a 69 year old construction worker living in Kerry. I am married with 4 children and 5 grandchildren. On the of 8th April this year, while celebrating at my Nephews wedding in Mulranny Co. Mayo, I experienced severe headache and a tingling in my jaw. Luckily my sister in law Margaret was present, who is a nurse, and she recognised the symptoms as being cardiac related. An ambulance took me from the wedding venue in Mulranny to Castlebar Hospital. At Castlebar I was admitted to A&E and within a very short period of time, I was assessed and diagnosed on what was a very busy night in A&E. Blood tests revealed I had suffered a heart attack. I cannot praise the nurses and staff in Castlebar A&E and ICU for their care and kindness to both myself and my wife during such a traumatic time. On Sunday 9th April, I was transferred by Ambulance to The Galway Clinic for an angiogram. The Cardiologist, Dr Pate performed the procedure on Monday 10th and it was at this point that we were told that I had 2 major blockages to my arteries and that I would require Bypass surgery. The resident cardiac surgeon at Galway Clinic was unavailable at the time and Dr Pate arranged a consultation with Professor Mark Da Costa of UHG for later that week. On meeting Professor Da Costa, he explained the procedure in detail and that the operation would be performed as soon as possible in UHG. A bed became available at UHG on Monday 17th April. I was admitted to the Cardiothoracic Unit where I received excellent care from all the staff while awaiting my surgery for Thursday 20th. During that time Professor Da Costa called on several occasions and spoke to my wife and I regarding the surgery. He put our minds at ease, which was a difficult task, as we were very concerned as I am an asthmatic and also a diabetic. However, his professionalism and kind manner was so reassuring we were immediately put at ease and felt very confident that the operation would be a success and I would be fine. On Thursday Morning, 20th April, I was prepped for the operation and taken to theatre. A double bypass was performed by Professor Da Costa and his team which was very successful. Later that evening I was transferred to ICU where I was monitored for 2 days before being transferred back to the Cardiothoracic Unit. While recovering on this ward, I had the very best of care from all the medical team and within 4 days I was deemed strong and healthy enough to be discharged. My wife and I would like to say a special thanks to CROI. Being from Kerry, my wife would have been unable to commute daily to visit me. CROI is an exceptional facility which was made available for my wife Mary. CROI offered her accommodation at the Courtyard Apartments, which is a 10 minute walk from UHG. At a very stressful and traumatic time, CROI were very supportive and it was one less worry on our minds. Finally a huge and heartfelt thanks to Professor Da Costa and his team. You have changed the course of my life and for that I and my family are eternally grateful. We wish you all the very best on your 10th Anniversary and long may it continue. Local Company Leads Way in Supporting Stroke Recovery! 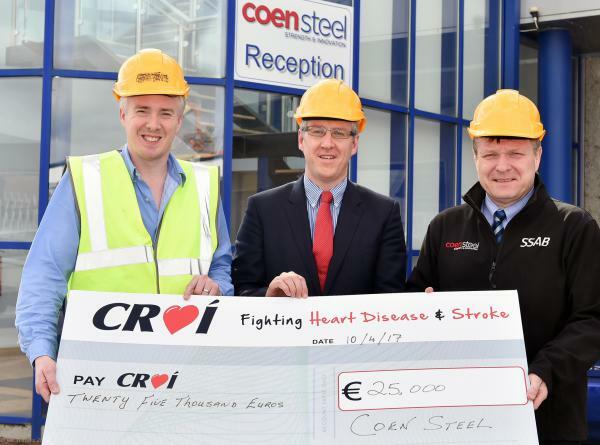 Pictured at the announcement of a 3 year commitment by Galway Company Coen Steel in the amount of €25,000 to support Croí’s work in the area of post-hospital Stroke recovery, photo shows (left to right) Derek Coen, Sales Director Coen Steel, Joe Kavanagh, Corporate Relations Croí and David Coen, Managing Director, Coen Steel. Posted in NewsLeave a Comment on Local Company Leads Way in Supporting Stroke Recovery!